About a year ago, all music on MySpace from 2015 and older stopped working. 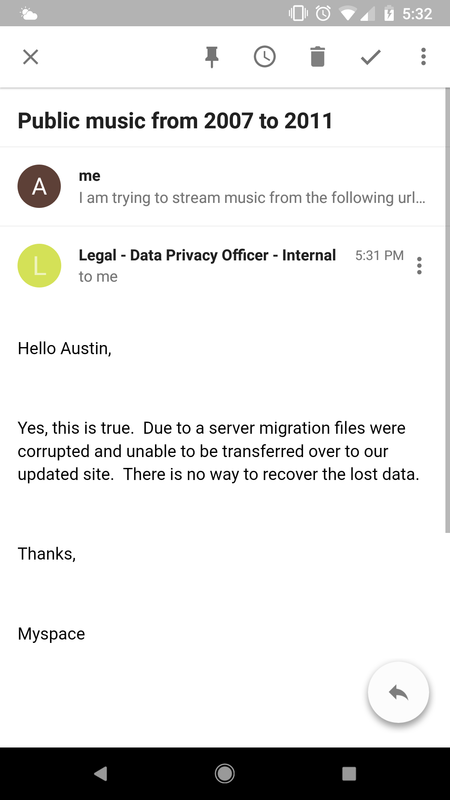 At first MySpace said they were working on the issue, but they eventually admitted they lost all the data (and apparently didn’t have backups?). As a result of a server migration project, any photos, videos, and audio files you uploaded more than three years ago may no longer be available on or from Myspace. We apologize for the inconvenience and suggest that you retain your back up copies. Cautionary tale: Keep multiple offsite backups of anything you can’t afford to lose.